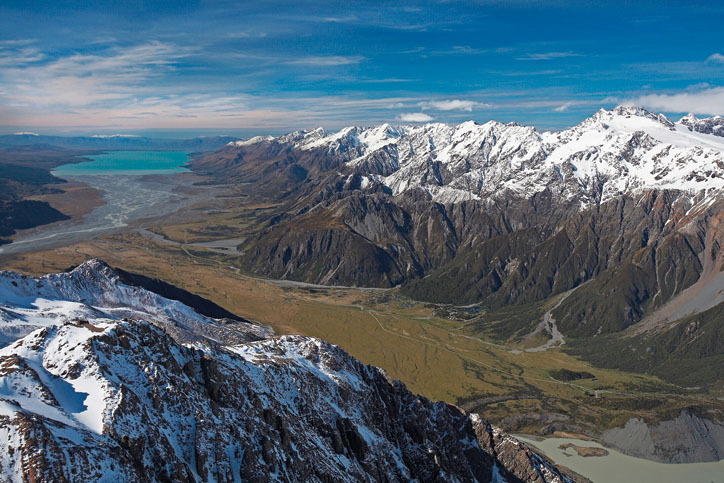 The Tasman Glacier, New Zealand’s largest, and one of the only accessible glacial lakes containing icebergs in the world! 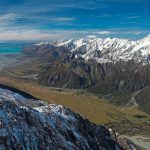 Travel by bus from the Hermitage Hotel to the Tasman Valley, followed by a 30 minute alpine walk through the moraine and National Park. 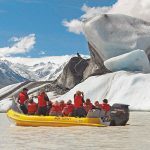 An experienced guide will then whisk you away across the rapidly growing terminal lake in a stable MAC Boat, taking in spectacular mountain views and scenery and the melting ice-face of the Tasman Glacier. View the Tasman Glacier ice face from a safe distance and icebergs of all shapes and sizes with the opportunity to touch and taste the 300-500 year old ice crystals. Layers on top (warm and waterproof), sunblock, sunhat and sunglasses, long pants and walking shoes. Be prepared for the elements. Tour is operated in English. A printed navigator in Japanese/Chinese/Korean is available at check in. The Glacier lake freezes over winter so the start of the season is subject to the lake thawing In the event of unfavourable weather conditions the tour may be cancelled. This decision is made by the Head Guide just before each trip based on weather and lake conditions. An alternative trip time or full refund is offered under such circumstances. Made in New Zealand, our custom built MAC boats are virtually indestructible and the first choice in safety and durability. They are fully moulded polythene one-piece double skinned pontoon boats made from quality virgin polythene. They’re impervious to osmosis and corrosion, designed to survive New Zealand’s extreme UV level and have a low environmental impact because the polythene is fully recyclable and colour fast. There are 29 reviews of this tour from past clients of Relaxing Journeys, averaging 4.8 out of 5. Good trip for hiking lovers who will have 40 - 50 mins walk to Tasman Glacier, and finally touch and even taste the Ice in the river. Great! The tour was excellent. We can see, touch and even taste the iceberg. Ryan (our tour guide) was great. He drove us close to the iceberg but with certain safe distance. He proactively took photos for us. I can say that this tour experience is better than I expected. The tour and experience with the guide information makes for an amazing experience. Fantastic. Very well organised with very knowledgeable guides. We were on the boat Anabatic and the driver whose name I missed was exceptional. Funny, humorous but very serious when needed. Thanks for making our last adventure in New Zealand so memorable. An out of the world experience! Breathtaking views of Mt. 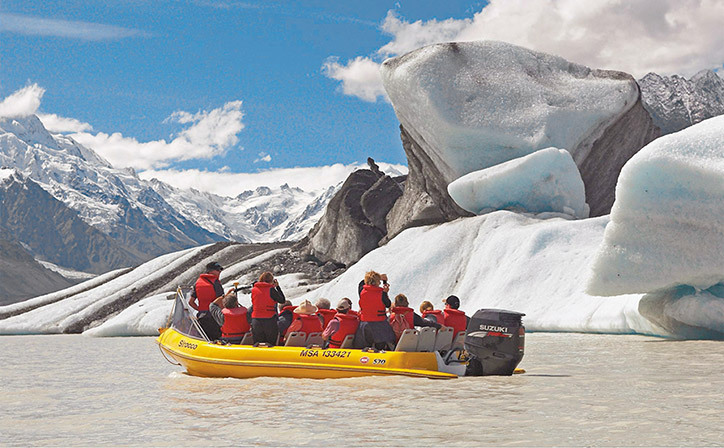 Cook and Tasman Glacier, excellent tour guides and thrilling boat ride in the Glacier Lake touching the Icebergs. Will come back again for this trip in the future.